This is my favorite pizza pan to use above all! I wasn't sure about it at first since it had holes in it, but it has never let me down. It works great whether I'm making pizza from scratch or tossing a frozen pizza on in a rush. The crust always comes out 100% done all the way through - no more checking to see if there is a surprise gooey spot in the middle! I love that it's non-stick when I'm making pizza from scratch, it's so much easier to get off and a lot less messy, and it cleans up great. I found a great pizza pan!!! 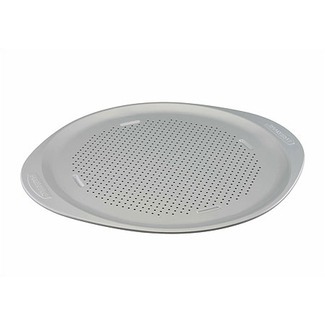 It is non stick and has holes on it so your pizza comes out crisp in the crust without having to place it directly on the oven rack! Perfect pizza every time!